Round the Bend Farm invites you to enjoy Easter at the farm. We will be hosting an Easter Egg hunt for all–young and young at heart! 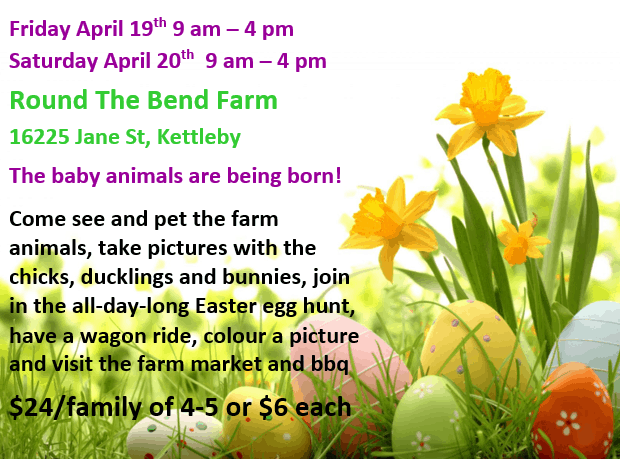 Come anytime and have fun finding a dozen different coloured eggs hidden in bushels around the farm, and exchange them for an Easter bag of treats. No rushing around, pushing or shoving. Just lots of fun for everyone! Activities: Easter egg hunt. Visit the barn and see, pet and hold the baby goats and bunnies. Play on the farm hoppers in the hopper corral. Visit the greenhouse and hold the chicks and ducklings. Colour an Easter picture. Have a farm wagon ride. BBQ available. No registration necessary. Children of all ages welcome. Admission applies from age 2 – 92. Come and enjoy the farm with us!